For years I have had the chance to volunteer at the Minnesota Newspaper Museum at the Minnesota State Fair. A few years back it was a self-contained museum in the fair’s Heritage Square section of the fair grounds. Today, the museum, owned by the Minnesota Newspaper Foundation, is located in the 4-H building. The setting has changed, but the purpose remains the same: educate people about the role of newspapers in a free society. Everyday throughout the run of the fair, a new edition of the four-page Maynard News is printed on the old Babcock single revolution, two-page cylinder press. The type is either handset or comes from the museum’s two Linotype machines. Other equipment at the museum include a folder together with Chandler and Price and Kluge platen presses. 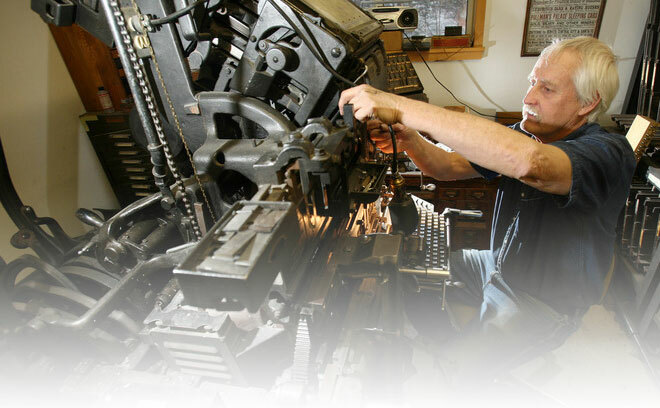 The museum maintains its “hot-metal” theme, in part, as a tribute to the long tradition that letterpress technology contributed to spreading the news. A few years back, the former director of the Minnesota Newspaper Association, Robert M. Shaw, and I collaborated on printing and publishing a wonderful book titled Life In The Back Shop. The book tells the stories of the men and women who labored to produce newspapers, often working in miserable conditions around dangerous machinery for a pittance of pay. It brings these “back shop” workers to life, telling about their quirks, their adventures, their sometimes unpredictable behavior, and the memories of their days in those hot-metal newspapers. It brings to life the characters who roamed the letterpress world in ways that make you smile and laugh. Mr. Shaw’s telling of their stories is a masterpiece of journalism. Mike, Enjoyed your newsletter, and happy to learn the letterpress museum is still at the fair. Still wanting to meet you in person and have a tour of your shop. I want to purchase a copy of Life in The Back Shop. I’ll send you a check as soon as I receive it at: 26285 County Road 19, Merrifield, MN 56465. I am still here and still open to having you visit. Just give me a heads up first.